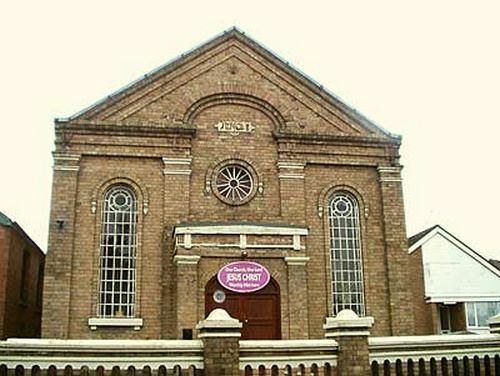 This Baptist chapel, built of yellow/brown brick, was erected in 1857-8 (to replace their former meeting place) at a cost of £490 for both the land and the building, to a design by Mr W. Davies of Coalbrookdale. The foundation stone was laid on 25 August 1857, and the chapel opened for worship on Good Friday the 2nd April 1859. In the arched centre bay there is a cast iron tablet bearing the word ÆNON & in the gable above there is a small iron roundel bearing the date 1858. The chapel is still in use in 2017 & in good condition, the interior having been refurbished in 2000. There is a Baptist Sunday School built (at a cost of £800) in 1931 to the left of the chapel but not visible in this photograph.